Iraq's interim prime minister has been accused of manipulating the trial of Saddam Hussein for political ends. Salem Chalabi, the former head of the special tribunal set up to conduct the trial, accused Iyad Allawi of planning hasty show trials and executions. He also said he had been forced out of his post after murder charges were concocted against him. 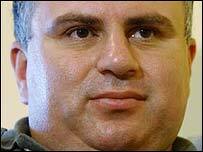 His uncle Ahmed Chalabi had been tipped to become prime minister of Iraq, until the US withdrew its support. In a statement Salem Chalabi said Mr Allawi's government wanted the trials of Saddam and his associates under way, and possibly even concluded, before Iraqi elections scheduled for January. With mountains of paperwork to consider, he said the investigations were a long way from being ready and would certainly not "meet minimum standards of due process". "Show trials followed by speedy executions may help the interim government politically in the short term but will be counterproductive for the development of democracy and the rule of law in Iraq in the long term," he said. Mr Allawi said recently he expected the trial of Saddam to begin as early as October. In August, murder charges were laid against Mr Chalabi, a US-educated lawyer, and counterfeit charges against his uncle Ahmed. Mr Chalabi was replaced as head of the Iraqi Special Tribunal by a member of Mr Allawi's own party. In his statement Mr Chalabi said the new head was answering directly to the prime minister. Mr Chalabi also said the murder charges against him had been dropped, but this was denied by an Iraqi judge on Thursday. "The investigation is still going on. I don't know why he is saying that," said investigative judge Zuhair al-Maliky.